The MasterComposter is an ideal system for our landscaping and conservation customers being particularly useful for community gardens and allotments where more volume and the versatility to create multiple bays to segregate different wastes might be useful. 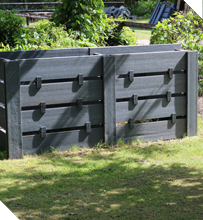 Our a MasterComposter is extremely durable and robust, an open boarded New Zealand Box design, 1200 x 1200 square with a height of approximately 1 Metre, which gives a 1500 Litre capacity. We supply in flat pack form only and it is a straightforward assembly process but better with a minimum of two people together. The bins are available in two options - single freestanding units or interlocking. 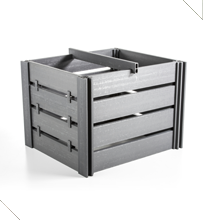 The bins are four sided with no base and thus sit directly on your chosen ground or base. The option of a recycled plastic lid is available but often customers just put a piece of carpet over the top which will help to retain heat generated in the composting process and control rainwater entering the bin. 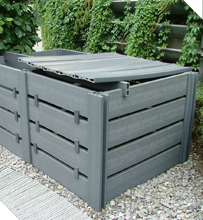 We only do one colour which is a light grey and as with all the Masterpile range the composter is made from 100% recycled plastics - mainly post-consumer plastic waste. 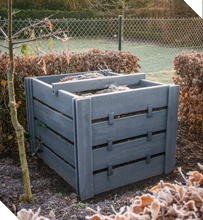 Given the durability, size and multi bin options it is particularly suited for community gardens or gardens where the larger capacity is preferred. The system allows for interlocking bins to be sat next to each other sharing a middle wall which helps to reduce the overall compost system cost. Being made of 100% recycled plastic planks it will never rot. For further information do call us or email us.